The agreement to hand Russia the 2018 World Cup before the vote took place involved "big players" in Fifa, says president Sepp Blatter's adviser. Klaus Stohlker said there were "behind-the-curtain" talks involving members of the Fifa executive committee. The suspended Blatter has suggested there was an agreement to give the 2018 and 2022 World Cups to Russia and the USA respectively. The 2022 event was later awarded to Qatar after a swing in the voting. "Before the decision was taken, in the case of Russia and the USA there were 'behind-the-curtain' talks," said Stohlker, who is acting as Blatter's spokesman during his 90-day ban. "It was not everyone in the Fifa executive committee but it was the big players that had these talks." The head of the organising committee for Russia 2018, Alexei Sorokin, said he was not aware of it having been rigged in any way. "If there were people who had a clear position on who to vote for, it's their right, they are entitled to that. It's their business to make decisions about world football," Sorokin told World Football Insider in an interview. "All I know is we did not know the outcome of the vote until after the vote." The bidding process for the 2018 and 2022 tournaments is the subject of an ongoing Swiss criminal investigation. It was begun alongside a US inquiry following the arrest and indictment of several top executives by the US Department of Justice on corruption charges. Swiss Blatter, 79, is serving a 90-day ban alongside Uefa president Michel Platini, 60. Both deny any wrongdoing. The Football Association spent £21m, including £2.5m of public money from local authorities, on England's attempt to host the 2018 tournament. Hugh Robertson, sports minister at the time of the vote in 2010, has accused Fifa of having been "dishonest" with England. He said: "We were encouraged to run by Fifa and we have now found that the whole thing appears to have been cut up beforehand. Fifa were effectively dishonest with us. "A considerable amount of time and expense went into preparing the bid, we had the best inspection report quite easily out of all the bidders. "It also means a considerable number of Fifa executive committee members lied through their teeth to us." Former FA vice-chairman David Dein said he had a feeling of revulsion when he learned what Blatter said about the awarding of the 2018 and 2022 World Cups. "I felt astonishment and abhorrence," he said. "We wanted a clean joust and it has transpired it was anything but. It appears that the game was being played with a loaded dice." 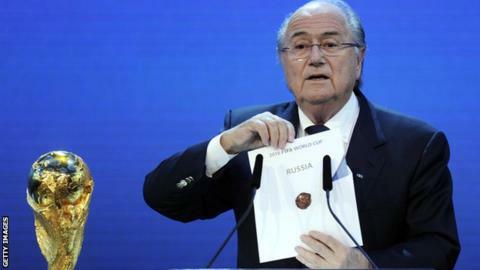 Russia 2018 World Cup 'agreed before vote' Who could replace Blatter?